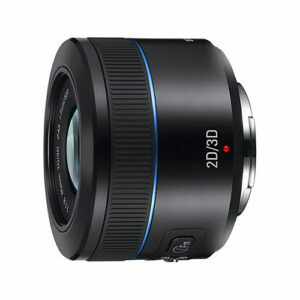 Lens Description: The black 45mm f/1.8 [T6] 2D/3D Lens from Samsung is hybrid 2D and 3D lens for NX system cameras. In standard 2D mode it has a maximum aperture of f/1.8 for low light shooting and shallow depth of field capability. Its focal length is equivalent to 69.3mm in the 35mm format and it can focus as close at 19.7" (0.5 m). As a 2D lens it is compatible with any of the NX series of cameras. However, with the Samsung NX300 digital camera it is also capable of producing 3D photos and videos. 3D functioning is engaged by a switch on the lens which drops a secondary dual LCD shutter into the optical path. This shutter creates two slightly different images which are both rendered on the NX300's 20.3MP sensor and processed by the DRIMe IV image engine into one 3D image that is viewable on 3D-enabled televisions or other viewing devices. In 3D mode, the lens has a maximum aperture of f/3.5 [T/6].